The large earthquakes and tsunamis in Sumatra, Chile, and Japan have accelerated efforts to rapidly determine the location, size, energy, and amount of displacement caused by large earthquakes to assist in response and provide timely warnings of related hazards such as tsunamis. Dense regional Global Positioning System (GPS) or Global Navigation Satellite System (GNSS) networks in western North America and Japan that stream real time data can provide earthquake characteristics within two minutes for rapid assessment and response. Using geodetic networks for rapid estimation of earthquake characteristics represents a new and powerful tool for hazard response and mitigation. Most people are familiar with seismometers as the primary tool that geoscientists use to understand earthquakes. Indeed networks of seismometers and ground motion sensors provide exquisite records of seismic waves traveling through the Earth and precise details of earthquake characteristics. 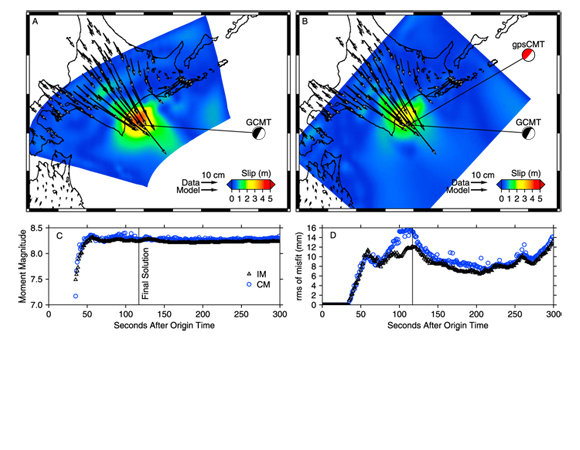 During a large earthquake, seismic instruments close to the event cannot be used and geoscientists have to wait until the waves travel to farther stations to characterize the earthquake. This can delay rapid assessment that might be needed for timely warnings of tsunamis generated by the earthquake or other hazards. With the buildup of geodetic networks and studies of methods to quickly determine earthquake characteristics, there is an excellent opportunity to provide rapid assessment of related hazards using geodetic networks to mitigate lives lost and secondary damage. In Japan, GEONET consists of more than 1,200 GNSS stations throughout the country and this study used 356 of those stations. In southern California, the California Real-Time Network (CRTN) consists of 157 GPS stations in southern California. Some stations are supported through the Plate Boundary Observatory operated by UNAVCO and the Bay Area Regional Deformation (BARD) operated by many partners. This study used 95 of CRTN stations. Both networks are dense enough and provide real time data, so they can be used for rapid assessment. 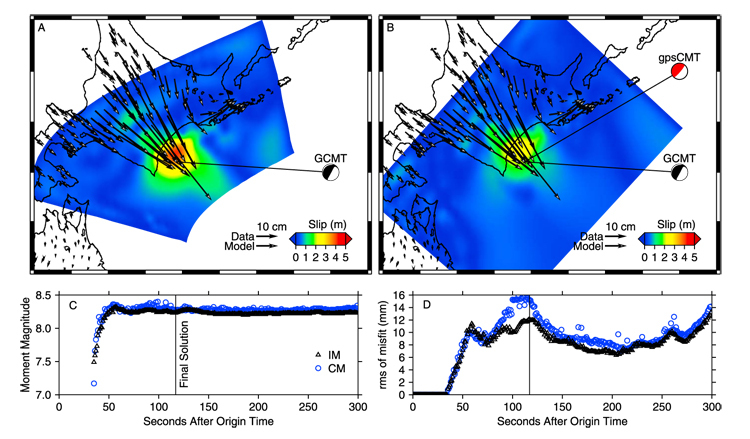 The authors used two approaches to rapidly estimate the earthquake characteristics with geodetic data recorded at the time of each event. One method used a predefined fault structure and the second method used a rapid centroid moment tensor solution to estimate the ruptured fault plane. The first method is useful when details of the faults at the surface and in the subsurface are known. The second method developed by the authors and previously discussed in an earlier publication, works in areas where little is known about the fault geometry or where the geometry is complex. 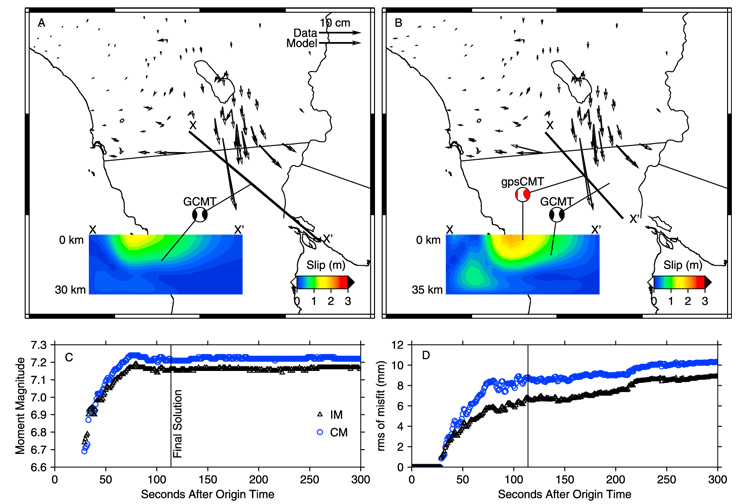 Data from two large earthquakes, one in Mexico (2010 Mw 7.2 El Mayor-Cucapah) and one in Japan (2003 Mw 8.3 Tokachi-oki) were used to test the models. Using only real time geodetic data that was available from the local networks at the time of the earthquakes, the modelers were able to estimate the earthquake characteristics in less than 2 minutes. The estimates were accurate enough to provide effective earthquake response and tsunami warning. Geodetic observations provide a new way to decipher earthquake characteristics and mitigate hazards. Crowell, B. W., Y. Bock, and D. Melgar (2012), Real-time inversion of GPS data for finite fault modeling and rapid hazard assessment, Geophys. Res. Lett., 39, L09305, doi:10.1029/2012GL051318. 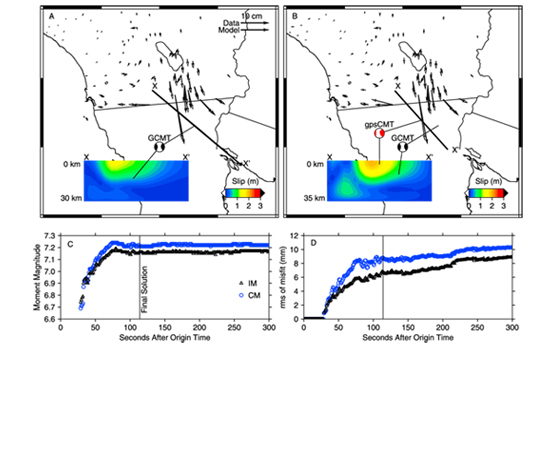 Melgar, D., Y. Bock, and B. W. Crowell (2012), Real-time centroid moment tensor determination for large earthquakes from local and regional displacement records, Geophys. J. Int., 188, 703–718, doi:10.1111/j.1365-246X.2011.05297.x.